I wear waterproof mascara and sunscreen almost daily. For a long time, I had just relied on good cleansing oil to remove them. I think liked the idea of taking care of everything by using one product. Maybe I was trying to be frugal, too. Then one day, I saw the melted black mascara running on my face and realized it wasn't as effective as I thought because it also seemed I was neglecting other parts of my face while concentrating on the eye area. I decided that it was time for me to use a separate remover again. When I first started wearing makeup, there weren't many options for waterproof eye makeup remover. The original Lancôme Bi-Facil was the exclusive one that was known to do a proper job, so my understanding back then was that I must shell out monthly for a bottle no matter what. If you can afford it, go for Bi-Facil by all means. I still believe it is one of the very best. Problem with a more expensive eye makeup remover is that you could easily end up hoarding without realizing it. The remover itself might be great, but skimping on it means possible irritation caused by tugging and pulling with insufficiently moistened pads. Luckily we have more options now including the affordable drugstore products. I happened to have found a few good ones that made my wallet much happier (and me, cause that meant more money for lippies), and I wanted to share them with you. I have mentioned in my drugstore favorites post about how great this remover is. It works fast without irritating my eyes or the skin around them. It is not greasy nor dry, which I find quite ideal. It is perfectly priced as well. This is another good one that I have recently found. Knowing L'Oreal is the parent company of Lancôme, I was hoping it would be near identical to the Lancôme Bi-Facil, but they are different both in ingredients and consistency. L'Oreal clean artiste feels much lighter, which makes sense since the oil part is only 1/3 of the bottle. It still does wonderful job effectively removing all my eye makeup. You guessed it. This one is the dud. It is the most expensive one here, which would have been easily forgiven if it did its job properly. My biggest problem with this is that it is darn difficult to mix the solution before use. I start with vigorously shaking the bottle 15-20 times, but it quickly separates back. I have to use my other arm to shake it another 15 times for equation. I don't want to end up with uneven arms, you know? Once it is mixed, it does an adequate job removing the makeup, which is why I haven't thrown it away. It takes more time and I need to make sure to moisten the pad well to avoid irritation. However, I have not experienced any real irritation with any of the products mentioned above. They don't burn my tired eyes from daily contacts wear nor my sensitive skin around the eyes. If you have drier skin type, I think you would prefer Lumene. 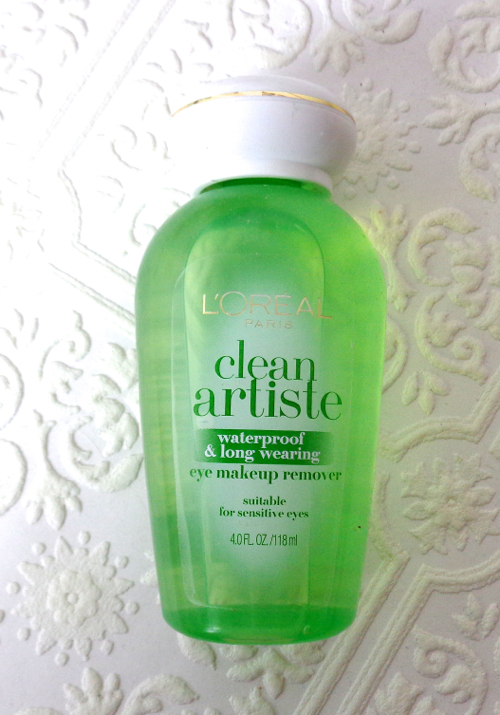 L'Oreal clean artiste can be more easily located and is better suited for normal to oily skin, in my opinion. Go for the Boots No7 if you want good daily exercise for your arms. 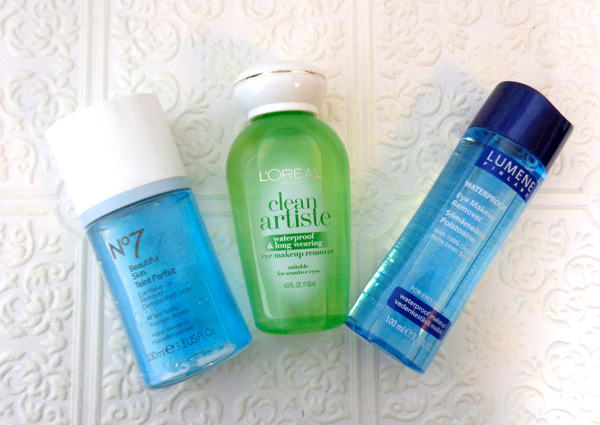 Have you tried any of these affordable waterproof eye makeup removers? How do you effectively remove your eye makeup at the end of the day? I only wear waterproof mascara when I have a race, and I just use olive oil to soften the mascara, then it washes off just fine with my regular routine. Otherwise I don't really need an eye makeup remover. I'd be really interested to learn about your waterproof sunscreen, though! Olive oil would be fine if it is just once in a while. I guess you don't wear contacts, though? i used to use seperate cleaners for eyes and face but now i just stick to using a cleansing oil all over. i'm give it some time to really remove everything so nothing is ever left. Hey Lena, bi-phase makeup remover is something I definitely prefer to go drugstore! I don't see much of a difference between drugstore formulas and high-end ones, so a lot of the times I grab a bottle of Maybelline or L'Oreal and call it a day :) I don't think I've seen any of these here though! I agree with you! It should be something you can liberally use without worrying about the price. This is the first time I've ever seen that particular L'Oreal remover. We have the new micellar water, original bi-phase and the non-oily version. We also don't have Lumene here, as far as I know. Where do you get yours from? There wasn't any bi-phase remover from the brand before, either. I guess this green bottle with "clean artiste" is the u.s. version. I've only seen Lumene offline from a drugstore chain called CVS, but I usually order mine from drugstore.com. This might make me put the baby wipes down and actually use proper remover! Baby wipes work just fine when in pinch, but you can easily upgrade for these affordable removers. Ugh drugstore eye makeup removers always puts me in a tizzy. The only one I have liked and tried so far is the Neutrogena one, but I know not many like it because it can leave a slightly greasy residue behind. This doesn't bother me because 1. it is the only thing that takes off every thing in one go with no pesky kohl lingering behind, hiding in my lashes 2. I double cleanse my face after so the greasiness doesn't matter. I haven't tried any of these though! I almost picked up the number 7 one once but I read reviews online and decided against it. You aren't alone in thinking it is a dud! 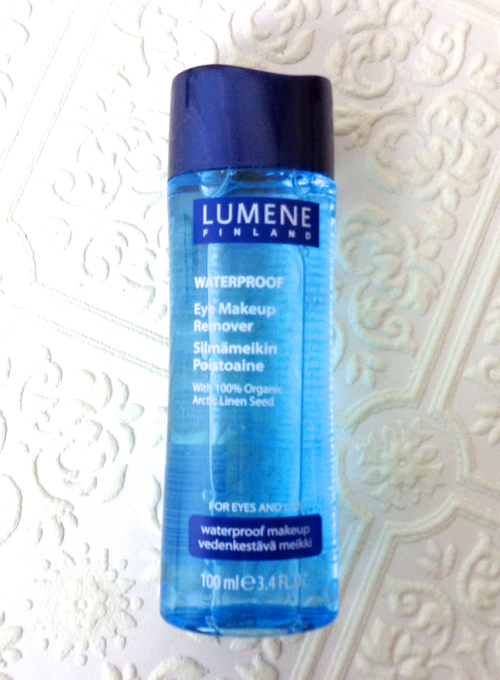 If you like the Neutrogena one, I think you'd like the Lumene remover a lot. I actually find the Lumene one even milder than the Neutrogena. Sounds like great options! I always remove my face make up with a combination of scrub and a foamy creamy face wash...and then wipe down any extra bits with a milky make up remover after the shower, I use oils or a oil based eye remover for the eye area. My favorite and holy grail for my eye area for removing my super super waterproof formula mascara is a l'oreal bi-facil eye and lip make up remover! I guess the european and asian version of the L'Oreal product is closer to the Lancôme. I am puzzled to think why it took so long for us to have an affordable one like this! I usually start with this eye makeup remover then use cleansing oil all over to remove my foundation/sunscreen then follow up with foaming cleanser and toner. I only use waterproof mascara when on holidays, but I use that the Clarins Bi-phase remover when I do. For every day that L'Oreal Micellar works great! I hope you guys get it. The Clarins one is great, too! Great review. I really like Clean Artiste. It does the job well. And for the price, you really can't beat it. I'm actually not a fan of Bifacil. It feels too oily for me. I love Lancome bi-facil, as well as Chanel gentle eye makeup remover, it's hard to find a close comparison but the Neutrogena one comes pretty close for me. Lumene sounds great though, must try to hunt it down! From the higher-ends, I like Chanel as well as Lancôme. Clarins makes a nice one, too. I haven't tried any of those! I'm now using Lancome bi-facil, and once I'm done, I'm switching it back to a lower end brand. I like the one from Biore. It's a Japanese drugstore brand and does the job very well! Oh, I love Kao Biore anything! Wish it was easier to find them here. I try to stock them up from oversea sellers but it isn't always easy since it takes much longer time! I used to use separate eye makeup removers but recently been using cleansing oils that removes everything including waterproof makeup, amazing! I'm exactly like you- I love using oil cleansers as it removes everything! I normally use Bioderma Sensibio afterwards with a cotton pad to remove anything that it has missed, but it usually does a fantastic job. We don't have any of these drugstore eye makeup removers in Australia :( I do however quite like a few of the oil/water based removers that we have that are quite affordable! Ah cleansing oil followed by micellar water is another clever method, it seems! That L'Oreal remover sounds pretty good. Neutrogena Oil Free Eye Makeup Remover is my standby. I find saturating a cotton pad and pressing it against my lids/lashes is key to getting my waterproof mascara off. I follow with a q-tip is there's any residual left. I tried using pure coconut oil recently but it's not that effective for waterproof formulas. I have used a couple bottles of Neutrogena but it sometimes burn my skin a little. I am wondering if they added more solvent to keep the formula oil-free yet effective. I'm shocked that Boots No. 7 is the worst one. I've never tried it but I kept reading it in articles how great it is. It's better to know people's opinion than article in my opinion. 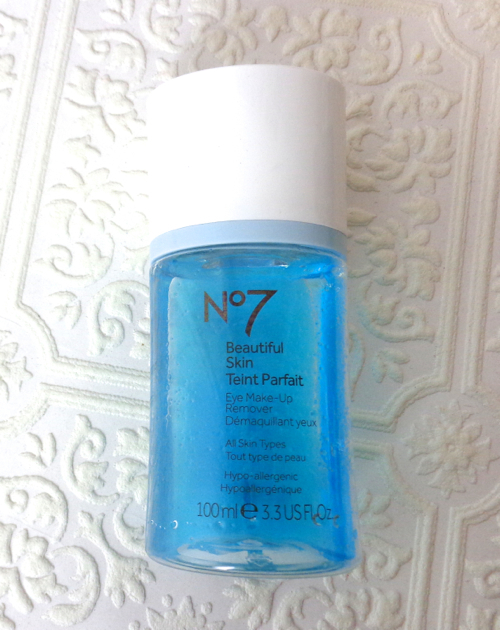 To be fair, the Boots No7 is not a bad product. If it was ten years ago, I would have been so happy to find any drugstore eye makeup remover that does the job without irritating. It's just that it takes more time and effort than other two I mentioned. I feel the same way about eye makeup removers. Currently using oil cleanser for everything, but I just noticed myself tugging on my eyes, which is not very pleasant. So maybe I will buy an eye makeup remover. Loreal one sounds promising. Never heard of the lumene. Will have to keep an eye on it at stores. I made 1:1 mix of olive oil and bottled water, it actually worked as well as lancome one. If you don't mind it, you should try it. The only problem I had was, I was not sure things were growing in it or not since I did not put any preservatives or anything. Making your own eye makeup remover isn't a bad idea although I myself is too lazy and lack of skills. LOL. I think it should be fine as long as you make a small batch at a time. I absolutely cannot live without the Lancome BiFacil when I first started using it - just like you said, it is simply one that did the job right the first time around! Glad to see some drugstore options here - thanks for sharing and not including the Bioderma Micellar Water (I think we all know it's great, but it's still great to see more options you know?) I'm curious about that Lumene brand but I think I'll check out the No7 one since we don't have Lumene or CVS in Canada! & great post... I was looking for a new makeup remover. I'm sick of the Neutrogena one I use.